HappyGiant’s Ninja Time Pirates is set to bring its historical mayhem to mobile gamers, as the game is now available to download on iOS. The action shooter / RPG contains a whimsical version of history, spanning back to World War 2, as gamers encounter famous historical figures, as well as aliens, in a storyline focused on popular conspiracy theories and time travel. Throughout the storyline, players will meet and fight alongside George Washington, Ben Franklin, Blackbeard, Cleopatra, Nostradamus, Erik the Red and more, as they take on an alien invasion. The aliens are out to “time-form” Earth by changing its past in order to alter its future, with battles taking place across Colonial New England to Ancient Egypt to Roswell and more. In each level of Ninja Time Pirates, players are asked to complete different objectives, including ones focusing on capturing, stealth encounters and ultimate destruction. Gamers can complete missions with a variety of weapons, including plasma blasters, gatling guns, “shurikenators,” time bombs, minimizers and more. A vehicle system is also present, including alien hover tanks, jeeps and UFOs. Each famous “Time Guardian” comes with his or her own special power, allowing players to destroy aliens using George Washington’s “Cherry Bomb” or Ben Franklin’s “Kite’ning,” as examples. 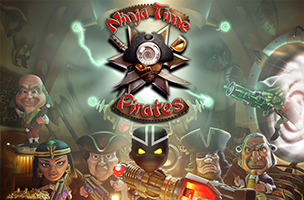 Ninja Time Pirates is now available to download for free on iOS. The game is also looking for support on Steam Greenlight for a PC and Mac release. Check back soon to follow Ninja Time Pirates on AppData, our tracking service for mobile and social apps and developers.